In my guess, CNRP is still obtaining many means to handling political negotiations. If there is no progress on demand for change on NEC, the attendance on the first National Assembly Convention might be shamefully missed the 55 elected members. Intensifying to the existing peaceful mass demonstration, the taking over national assembly by the CNRP alone, or the power share as a hybrid opposition within the winning constituencies/provinces, all are considered effective mechanism for genuine reform and change. Thomas Hobbs on his book of “The Leviathan” critically narrated the “state of nature”, “divine leadership” and “monarchy” as the type of government operated by the absolute and divine King. Almost 500 years now that his theory has still being embedded in Cambodia and I am keen to comment on it while the King of Cambodia: Preah Bat Norodom Sihamuni invited the top leaders of CPP and CNRP to the meeting to resolve the political deadlock caused by the recent National Election on July 28th, 2013. Watching TVK’s video clip of shorter than 20 minutes, the meeting is about listening to the King’s letter orally read by him with an unobstructed and unnatural tone. After that, the King handed the letter to both top leaders to invite them for the first session of national assembly. This scene surely pleased Premier Hun Sen but displeased Sam Rainsy, at an incalculable level. At the present, Cambodia has faced with the dilemma of two groups of people: the change challengers and the fans of the divinity. The election day and the subsequent days after the election roaming up to now, the cohort of youths and mass population have come out to the street to support CNRP without fear and reluctant in their expedition for change. As the matter of fact, the increase of seats of CNRP and the crowd joining with the peaceful mass demonstration manifest the truth of non-stopped challenging. The crowd is the message for civility, liberty and rights. But for the King who has been regarded as divine by the Cambodian people issued a letter on August 30th to appeal to all Cambodian compatriots to respect the existing mechanism of NEC according to the National Constitution in which analyst posed suspect on the inconsistent letter issued on August 7th that advised both rivals to negotiate and settle down conflict peacefully. Latter on, the King issued letter to support NEC to announce the election result as mandated on its schedule. Subsequently, this face to face meeting is to pre-arrange for the King’s call for the first convention of the National Assembly on September 23rd. as mandated by the NEC mechanism. This trend is moving reversely to the demand of the CNRP that has continuously called for the not-free and not-fair election conducted by the NEC since before and after the election. CNRP has repeatedly called for the delay of result announcement, but no one care! Now, CNRP is likely speechless as the King will convene the first National Assembly and handed the invitation letter by televising it to his people entire the country. The puzzling question is that why NEC is seen so protective especially by the divine King? Why the demand of CNRP which is representing “change challengers or civility” is not on the eye of the King? CNRP’s leadership is going to face tough decision making as one is their challenging supporters and another is their respectful divine King. At this crossroad, politics is about “survival” and I hope it is not the “survival of the fittest” described by Darwin. For Premier Hun Sen, he is likely happy with the provision by this power of divinity in the meantime that Sam Rainsy can tell the reporters only that “meeting today is no no, nothing”. Many observers and writers have said the same tune that the popularity and the important role of the King of Cambodia is on the rim of decline. This inclination is possibly caused by the increase in civility and respectful neutrality of the King especially during the occurring conflicts is not practical. Different from the King Father: Preah Bath Dhammakod, his presence in China is in China; no interacting letters were endorsed in Cambodia. While the King was absent, the substitute(s) can hold to power and authorize decision making vertically. But this time, observing from letter issued on August 30th, 2013 till now, the respectful neutrality has been gradually in a loophole. 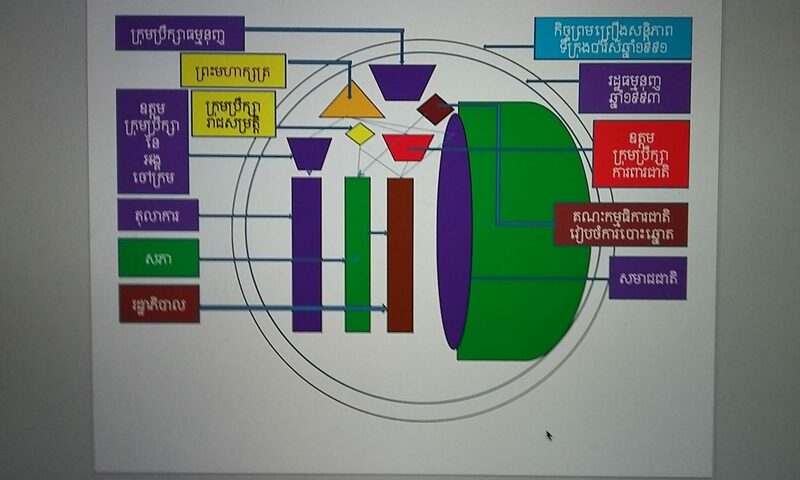 As the message of the CNRP has greatly outreached to the bottom line Cambodian people on the bad credibility of the existing NEC and calling for the creation of independent co-investigator; the mediation effort of the King is to push all parties to accept the existing NEC. No one know exactly what is happening NEXT because it is the myth of the politics. It is not a divine predestine but a human-oriented opportunity. The calling for mass demonstration by the CNRP on 15-16-17 of September shall be in business as usual. But to keep the flame alive on the prospect of change might be not on motion within the demonstrators. It might be on a set of classroom to instruct them about the exercise of civil rights and liberty. But it is very useful for the component of democracy that people “must be able to freely express themselves and exercise their rights without limit”, and importantly it will advocate for broader concept of “well-informed citizens”.